Always one of the highlights of New York Fashion Week, Ralph Lauren shows come to present diverse selections of chic and wearable clothing pieces with a luxurious take on simplistic designs that we want to own right away. The Ralph Lauren fall/winter 2015-2016 collection opened the last day of New York Fashion Week fall 2015 triumphantly, bringing glamour, elegance and luxury to the runway and making the audience ahh and ohh at the sight of each and every look showcased. Drenched in a soothing color palette and featuring easy to mix and match clothing pieces with the focus placed on comfort and coziness, the new Ralph Lauren fashion line becomes the definitive guide to dressing effortlessly and fashionably this fall. Best of all, for the first time ever the top looks from the show will be available for the same-day pre-order on the brand’s official website, RalphLauren.com, so you don’t have to wait two seasons to be able to add your favorite pieces from the collection to your new season wardrobe! Some of the coolest fall 2015 fashion trends have been illustrated in the Ralph Lauren fall/winter 2015-2016 rtw collection, from cozy knitwear and menswear inspired looks to dazzling outerwear options. The entire show was divided into three distinctive themes, each one painted in a different color and each bringing a different style. 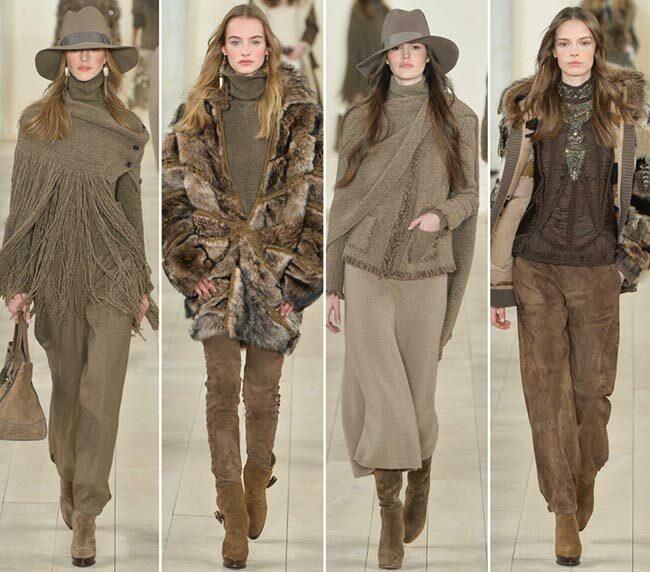 The show kicked off with an array of barney, fawn and chocolate brown shades spiced up with a muted variation of olive, which seem to be having a big moment in the new season. Luxurious knitting and furs took center stage in this array of looks, which were celebrating comfort and a laidback daywear style with touches of safari and perfectly tailored menswear fashion. The stunning star-studded sequins and feathers created a wonderful contrast with the casual knits, revealing the focal point of the entire line from the very beginning. We were later on treated to more absolutely dazzling shining looks with intricate beading and embroidery, revealing the awesome craftsmanship behind Ralph Lauren. 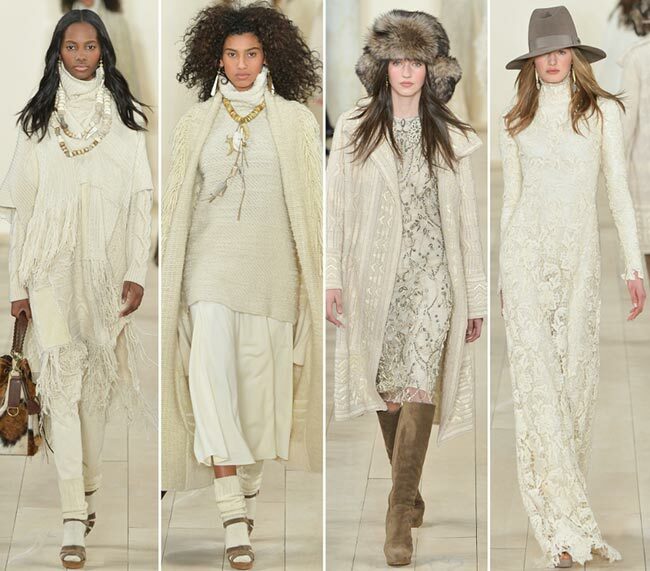 The second part of the show was into subtle cream shades, lots of fringing, macramé, knitwear and gentle motifs of fur. At this point, we also saw amazing evening-ready looks, particularly a floor-length minimalist lace dress that was surprisingly matched with a campaign hat to tone down the glamour in the look and create a beautiful contrast with the elegant dress. Outerwear was more about fringed capes and shaggy coats here that gave volume to the perfectly layered outfits. At the final stage of the show, we saw head-to-toe monochrome black looks, part of which was into masculine fashion, while another part was dedicated to glamorous evening dresses. Femininity was juxtaposed to androgynous vibes and we saw lots of tuxedo-inspired elegant night looks, like the high slit maxi dress with a deep plunging neckline or the maxi black skirt adorned with suspenders and worn with a classic white shirt, a black tie and a pinstripe blazer. The two closing looks celebrated glamour through shining sequins, the last one of which was matched with a big fur trapper hat and suede gloves with fur trimmings again for the same charming contrast. In addition to the chic outerwear designs, glittery evening dresses and cozy daytime looks, the Ralph Lauren fall/winter 2015-2016 collection brought some covetable accessories, such as big fur scarfs, hats, chic gloves with fur trimmings and handbags. The footwear was as dazzling bringing either high suede boots or platform sandals, let alone the masculine inspired Oxfords we crave so much! Wholly, it’s a line to inspire and teach one to look unique, effortlessly chic and always perfect any time of the year and for any occasion!